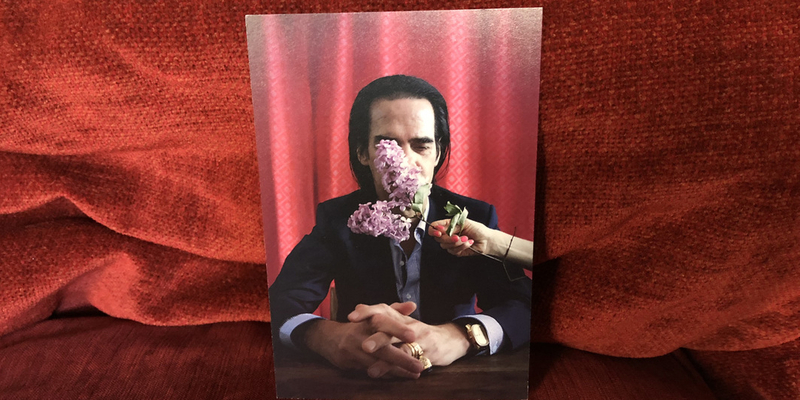 Promo card for Conversations with Nick Cave, 2018. Photo: Roger Wallace. Billed as a ninety-minute event, the Murmrr show stretched to a humid yet affable three hours. Cave wore a dark green Gucci version of his traditional black suit, emerald green glitter socks, and a lavender shirt. The small golden hand hanging below Cave's clavicle was designed by his wife, Susie Bick, whose line is called The Vampire's Wife. Cave never complained or flagged, even as the temperature in the hall rose, and a baby in the neighboring apartment block wailed for thirty minutes. If Nick Cave shows up near you and offers to chat, go. He is a gracious host. Cave’s experiment confirmed that he already has a way of finding and returning intimacy—as the singer and lyricist of the Bad Seeds—but it is logical that he might think his job had changed. Three years ago, Cave's son Arthur fell to his death from a cliff between Ovingdean and Rottingdean, outside Brighton. My familiarity with Cave is deep but inconstant. I was a teenager when I first heard a DJ play The Birthday Party’s “A Dead Song” on WNYU’s New Afternoon Show in 1982. The Birthday Party regarded convulsion as a musical principle and made most of their contemporaries sound timid. I loved the combination of Cave’s non-sequiturs (“I can sing / Hit it! / And make it a dead one / With words like blood and soldier and mother / OK, OK”) and the band’s gyroscope mode, playing in sync while never playing in unison at obvious points. When Cave started releasing records with the Bad Seeds, the decision tree changed. The band’s first single, a cover of Elvis Presley’s “In The Ghetto,” folded their chaos into kitsch. It was warm trash, a suppression of what had made Cave interesting. A year later, on “Tupelo,” Cave was still talking about Elvis, but he’d let the chaos back in. I loved it, but I also suspected that Cave was going to keep Vegas close at hand. In the decades following, I’ve had to get out when Cave’s schmaltz rose above the levees. But, in the narcissistic way of a fan, I came to believe that Cave and I saw eye to eye on Cave, largely because of one recording. It’s one of the band’s earliest songs, a drone broken into pieces by a descending bass line and four wobbling words: “From hEEeeEeeeeeR toooOoOoo eetEEEeeeerrnITY.” Violinist and guitarist Warren Ellis and Cave are seated for much of the performance, which does not diminish their energy. The collapse and rebirth around the chorus, repeated three times, is harrowing. There is not much affective difference between the Bad Seeds of 2015 and of 1997, and if I had to choose one era, I would take the recent past. But there’s an even more recent past. Cave had written most of the lyrics for the 2016 Bad Seeds album, Skeleton Tree, before Arthur's death in July of 2015, but he recorded all of the vocals after the event. Two and half hours into the night at Murmrr, Cave summarized how this album—and a 2016 documentary about the making thereof—opened up a practice of grieving and reflection. I have to say that One More Time With Feeling is Andrew Dominik's film...It is not my film. I wasn't even particularly interested in doing it. I commissioned him to do it because I love his films, and he’s a very, very dear friend. When my son died, I just had this idea to do it anyway—that things just went on. We went into the studio to work on Skeleton Tree and I was unable to do anything, it was just all too early, but Andrew would only do the film if he could approach the obvious elephant in the room. So, I allowed him to do that if I could edit out anything that I didn't like. In the end, the film was far too overwhelming for me to have any reasonable criticism one way or the other, so I left it up to other people to deal with. It's a weird thing to say because there's so much about it that I found really very, very difficult to look at, but there was something about the film. The film's a gift to the memory of my child by Andrew Dominik. It was extraordinary on that level to me, that we'd done something beyond burying him. 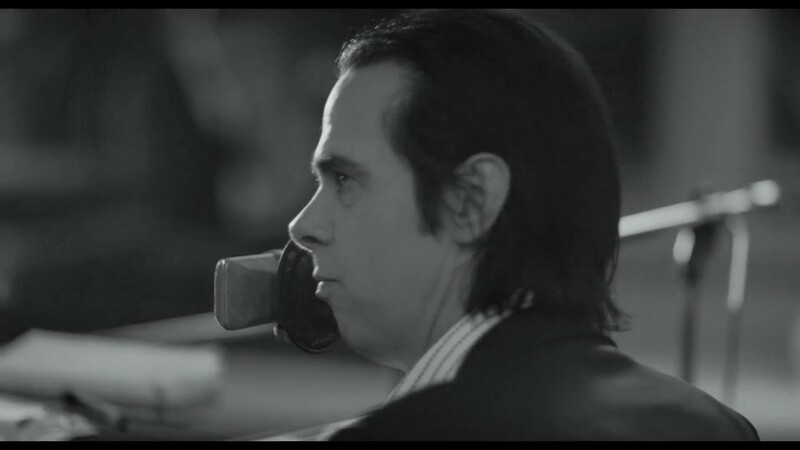 Andrew Dominik, One More Time with Feeling, 2016, color and black-and-white, sound, 112 minutes. And here’s why the Brooklyn event was more kaffeklatsch than katharsis: after hearing the above, the woman who asked Cave about the movie immediately followed up with a plea that the Bad Seeds continue to play small venues. It was like hearing someone cry out for customer service in the middle of a funeral. And the audience loved it. What Cave and the audience wanted might have easily have been two different things. 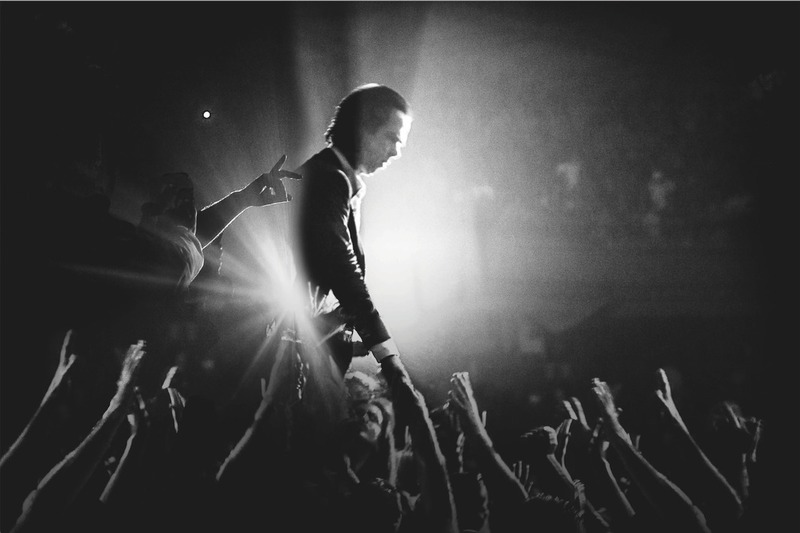 If you love Nick Cave to pieces, are you going to be the one to ask him about his dead son? About how he and Susie are feeling now, after what is both a lifetime ago and no time at all. And if you’re Nick Cave, what else can you do except sidle up to the elephant? Someone asked Cave what he did for fun, and he pointed out that everyone had tittered at the words “fun” and “Nick Cave” ending up in the same sentence. He confessed to liking TV, especially Fargo. “There is this kind of migratory spirit of evil that seems to be coming from generations before, and slowly infecting and moving through the evil characters in Fargo,” Cave explained. He took refuge at the piano when the questions were daft, playing his repertoire of songs that have formed the backbone of the Bad Seeds live set for the past five years. When he sang “Sad Waters” or “Into My Arms” or “Far From Me,” he didn’t project and he didn’t try to convince. It seemed he did it to soothe himself, to reset. Even the discussion of One More Time With Feeling was a kind of repertoire, variations on what he said last year in an interview with GQ about processing Arthur’s death through the experience of making and watching the film. The fans tried to establish familarity—calling him “dear” may not have worked—and Cave tends towards being careful and kind, so exchanges were uniformly friendly. But it was up to Cave to work around to the things he had promised to say, things nobody would have known he could say. After fielding a question about touring and the effect Dominik’s film had on his band, Cave hit what felt like a key, a statement for which he needed only a room and witnesses. And this is maybe why Nick Cave flew to America for a conversation, not because we would make him talk, but because we would let him talk.